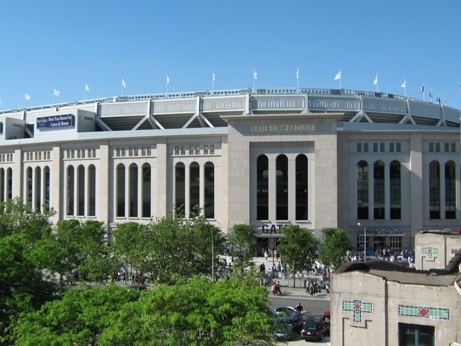 There are many ways to get to Yankee Stadium, some expensive, some cheap. If you’re being economical and coming from Manhattan, try using the 4 train. The MTA runs a pretty tight ship. Yes, trains get crowded, but they’re pretty efficient and relatively clean considering the traffic boarding on and off of them. There is an elaborate subway network in New York City that can get you from just about anywhere in the five boroughs to Yankee Stadium in two train rides and the transfer is usually free. Should I use the B or D? Hmmm…use the 4. Like many Yankees fans, I would be coming from New Jersey, so it’s likely that I would be using some sort of public transportation to get to a main transportation hub in Manhattan. Using the NJ Transit Northeast Corridor Line, for example, would drop me off at Penn Station. Unlike from the B or D, you know exactly where to go! 1) The View. 4 becomes elevated in the Bronx, as opposed to the B and D which remain subway trains. Until you exit the station, you won’t see daylight from the B or D. From the 4 platform you can see the Stadium come into view, which is as it should be. 2) Less confusion. The B and D lines don’t always stop at the Stadium; both lines run the same route but get to Yankee Stadium only at certain times of day. I think I have this figured out but I’m never sure: the B goes to Yankee Stadium during rush hour on weekdays, and the D goes there at all other times. At any time you can use one of them, but I’m never sure which one, and it doesn’t take long to walk a few blocks to a 4 station. Yeah, I can figure it out, but I like Grand Central too. 3) Speed. The 4 line has more stops but is an express train most of the time, including when you will likely to be headed to the game and need it most. From Grand Central to 161st is 13 stops, but on an express train it is only five. Not so the B or D.
4) Great Pizza. Here’s a bonus tip for pizza lovers. 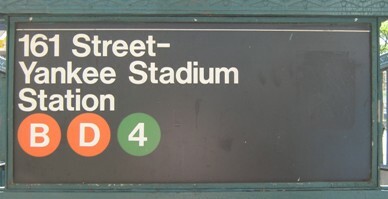 The 4 and 6 trains share the same line (Lexington Avenue), and using the 4 after a day game allows you to hop off and get on the 6 to Little Italy and Lombardi’s Pizza. 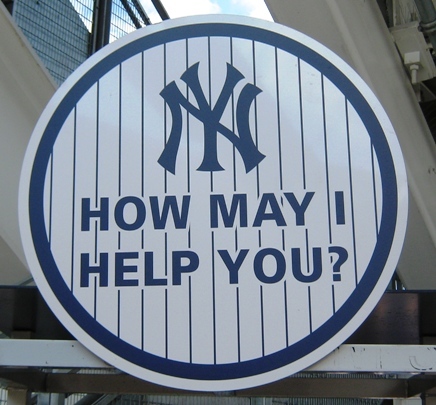 It may not be a valuable “get to Yankee Stadium” tip, but I’m not just just a one-trick pony! One last thing; if you’re coming an hour and a half before game time or less, the train will start to get packed with Yankee fans. If you can, try to hop on somewhere south of Grand Central for a better chance of landing a seat. That’s just one way to get to Yankee Stadium…there are also Metro-North trains, buses, even ferries…not to mention inexpensive and even free parking spots. But if you’re going economical, the 4 is as good as any.